First responders at south Everett townhouse fire. Photo courtesy of South County Fire and Rescue. By Courtney O’Keefe, Snohomish County Sheriff’s Office Communications Specialist. Snohomish County Sheriff’s Office detectives are investigating a south Everett garage fire where one man was killed and six other people were sent to the hospital. 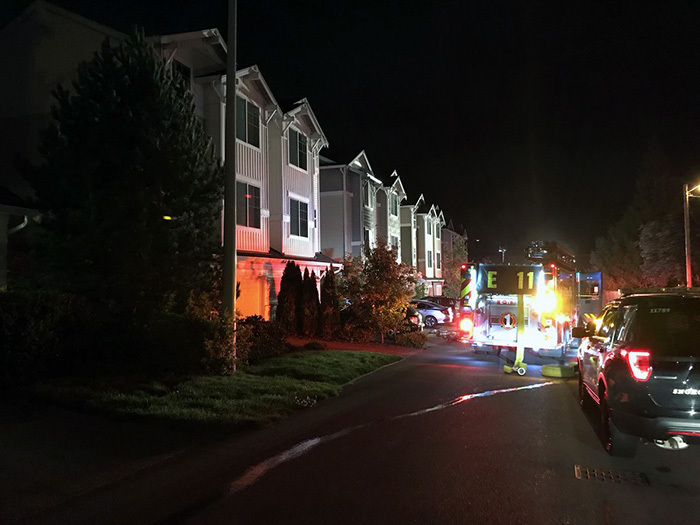 At approximately 12:51 am on Thursday morning, September 13, 2018, Sheriff’s Office deputies and South County Fire responded to a garage fire at a townhouse in the 300 block of 127th St SE in south Everett. A 29 year-old adult male was located deceased inside a vehicle in the garage. Six other people, four adults and two children, from the same residence were transported by aid to Providence Regional Medical Center for exposure to smoke.